As is well-known among musicians, certain of the harp’s strings are coloured in red: and, indeed, several fascinating red threads can be found throughout the programme of this CD published by Da Vinci. It features works written by French composers of the twentieth century; many of them also share significant biographical aspects and stylistical traits; and all of them were women, though this very visible feature should not obfuscate the quest for musically meaningful similarities or differences. Undoubtedly, the harp as long been considered as an instrument particularly well-suited for feminine hands and spirit; it was seen as enhancing the natural grace and delicacy of girls and women, and, along with the omnipresent piano, was (and still is) very popular among female players. 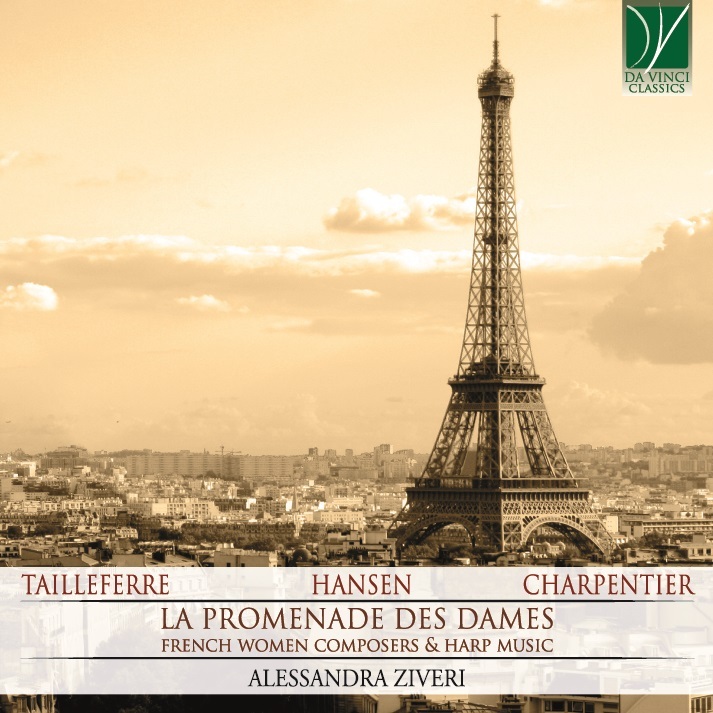 From the intertwining of the significant female presence in the history of harp performance with the continuing focus of French composers on harp music and with the glorious history of harp teaching and playing in France, it comes as no wonder that the collection of pieces found in this CD includes examples of exceptionally fine artistry. Undeniably, the center of the stage is taken by Germaine Tailleferre, who is probably the only one among the composers represented here to have achieved worldwide recognition and to be numbered among the leading musicians of the twentieth century. Born in 1892 near Paris, Germaine received her first music lessons from her mother, who was a professional piano teacher. The child seemed to long for music, and showed effusively her enthusiasm when it was her turn to practise on the family piano. Along with her musical talent, however, the young girl manifested several other gifts, among which a particular ability and sensitivity for the visual arts, whose study she actively pursued. If Germaine’s mother was highly supportive of her daughter’s musical education, the same could not be said of the composer’s father, who expressely prohibited it; mother and daughter had to resort to secretive strategies in order to allow Germaine to attend the Conservatoire’s classes. At the Conservatorie, she met with some of the leading musicians of the preceding generations and of her own: she was examined by Faure, befriended George Auric, Darius Milhaud and Arthur Honegger, and was introduced to the secrets of the harp and of its technique by a legendary female professor of the institution, Madame Tardieu. Together with some of her former fellow students, and under the guidance of Eric Satie who nicknamed Germaine “his musical daughter”, the young musician was able to create artistic and personal relationships which would leave a distinctive mark on the history of twentieth-century music. Tailleferre, in fact, was the only female member of the so-called “Groupe of the Six”, who represented a quintessentially French and modern response to the opposing trends of Impressionism and Expressionism. Against the former, the Six favoured clarity, neat lines, Neoclassical inspiration and clear-cut shapes; against the latter, the Six sought a purposefully “lighter” musical style, whose restraint in the expression of personal feelings and whose never entirely serious traits suggest almost a philosophy of irony. Their music, in fact, deliberately eschews solemnity, sublimity and severity: in so doing, however, it does not seek the easiest path, or a facile success, but rather proclaims the values of good-heartedness and simplicity as a response to the tragedies created by the “great” ideologies of the century. Tailleferre was frequently likened, by both her friends and her foes, to the Kleinmeister, the lesser-known masters of the Classical Era. She substantially endorsed this view, and deliberately espoused it in works such as the Sonata alla Scarlatti recorded in this CD. The piece seems to enshrine the elegance, humour and aristocratic nonchalance of the Baroque courts; from Domenico Scarlatti’s style it derives form and compositional formulas, but the sometimes harsh contrasts and dramatic clashes of the Italian composer are somewhat tamed in this delightful stylistical exercise. A possible pedagogical aim may be discerned in this piece, which may be employed by harp students as a preparation for Scarlatti’s own Sonatas (though this piece was originally written for a professional musician); the same educational concern is observable, in a clearer fashion, in Le Petit Livre de Harpe de Madame Tardieu, a collection of eighteen Etudes referencing, in their very title, the crucial role of Madame Tardieu in revealing to Tailleferre the possibilities of the instrument. Even though, as is customary with Etudes, each piece focuses mainly on a particular technical challenge, what characterizes them best is their fresh inspiration, their almost childlike pleasure in exploring the various resources and problems of harp playing. It is also rather unique that a fine collection of harp Etudes be authored by a musician whose first instrument was not the harp; and, indeed, occasionally there are slight technical oddities which may reveal a hidden pianistic thought behind the harp figurations. In spite of this, however, the beauty and variety of this collection takes it much further than a mere set of exercises, and fully justifies its inclusion in a programme such as that of this CD. The piece de resistance, however, is Tailleferre’s Harp Sonata, which is certainly the best-among her works featuring the harp, and one of the pillars of the twentieth-century repertoire for this instrument. Composed in 1953 for Nicanor Zabaleta, a legendary harp player who commissioned and premiered many contemporary pieces by the leading composers of the era, and who had been thrilled by Tailleferre’s Concertino pour harpe et orchestre, the Sonata represents the composer’s definitive word in the field of harp music, and her full mastery of the idiosyncratic language of the instrument. A fascinating net of influences and a rich blend of constrasting – and yet entirely integrated – styles concur in shaping the unique features of this work, which navigates authoritatively between gorgeous sonorities and ironic traits. The harp is given so many opportunities to showcase its full expressive palette that, significantly, Tailleferre herself realized an adaptation of this piece for soprano and orchestra, thus revealing her concept of the harp as both a “singing” instrument and a resource capable of complex polyphony and timbral variety. These qualities were certainly well-known to the other two composers whose works are featured in this CD, and particularly to Louise Charpentier (1902-1964), who had first fell in love with the harp when, at the age of six, she had been presented with a stringless instrument by her grandmother. Similar to Tailleferre, also Charpentier had to overcome her family’s prohibitions and their misgivings about her musical studies, even though – again as in Tailleferre’s case – music was a family affair in her parents’ household, as both Charpentier’s father and grandfather were professional musicians. Eventually, she was able to devote herself to music, and was able to play a variety of instruments, though the harp remained her favourite. In fact, she was known for such delightful undertakings as the Jean Sebastien Mouche, a bâteau-mouche on which she used to play for children, and her Boîte à musique, a truck on which she could transport her instrument, perform on it and even sleep and live, in order to bring her music to unusual settings and contexts. Her Rapsodie is just one in the rich collection of original works for the harp and transcriptions she realized for her favourite instrument; it is remarkable for its luxuriant writing and densely woven episodes, where the composer’s fresh inspiration frequently takes the form of seemingly improvised waves. In turn, also the third composer in this CD, Renée Hansen (1900-1985) came from a very musical family: her father was the founder and director of the Conservatoire in Reims, her sister Thérèse was a professional harp player and teacher at the same institution, and Renée’s husband was Pierre Jamet, one of the greatest harpists of the early twentieth-century. Renée herself was an accomplished cellist and composer, who had studied with the legendary Nadia Boulanger and taught the equally legendary Pierre Boulez. Her Variations sur un Thème Mineur were dedicated to her husband and published immediately after the end of the Second World War (1946); the work both hides and reveals, at the same time, the mixture of pain and hope of the war years, the net of musical and human ties which rendered the instrument so special for the composer, the public and the private dimension of the work as a token of love from a wife to her husband and as a token of esteem and trust from a composer to the performer of her works. Thus, the three composers in this CD, each in her own fashion, gave a distinctive and fundamental contribution to the repertoire for this instrument in the twentieth century; and if a common “female” trait can be found in their writing, it lies not in stereotypal characterizations such as “graceful”, “gentle” or “charming”, but rather in their exquisitely feminine capacity of living music as a form of love, and love as a form of music. Alessandra Ziveri was born in Parma and graduated at the G. Nicolini Conservatoire of Music in Piacenza under the guidance of Prof. Annamaria Restani. In the same year she obtained the Certificate of Merit as best harpist and the Certificate of Merit as best student of the course of History of Music. She got the Second Level Degree in Harp and Chamber Music with honors at the Conservatoire of Parma. She participated in numerous National and International Music Interpretation Competitions always reporting excellent results and First Prizes. She is an harp professor at the Attilio Bertolucci Liceo Musicale in Parma and in several Schools of Music in Parma and Reggio Emilia. She recorded the CD "Musica per arpa" dedicated to the original compositions of Alfredo Casella and Luigi Perrachio (Ed. Tactus, Bologna, 2016), the CD "Parafrasi Verdiane" (Ed. Tactus, Bologna, 2013 ) with the duo of harps called Alchimia Duo, and the CD "Grovigli" with music composed by F.Petrini, M.Tournier, G.Gershwin, B.Andres and other authors always in duo of harps. In 2007 she recorded the CD entitled "Between Skies of Ireland and Clouds of Scotland" entirely focused on the Celtic, Irish and Scottish repertoire in duo harp and flute. She took part in the juries of the "Fifth International Harp Competition" held in Saluzzo, at the ninth edition of the "E Lucevan le Stelle" competition organized by Parma Lirica and at the "National Music Competition Città di Guastalla". Her activity focuses on solo harp concerts with both classical and Celtic harp and in various chamber and orchestra ensembles. She recently performed concerts focusing on original Italian music for the early twentieth century harp including: the 'Suono Italiano' organized by CIDIM at the 'Italian Institute of Culture in Istanbul, the Museum of the Twentieth Century (Milan), Museum Vincenzo Vela (Switzerland) Auditorum Vivaldi (Turin), Villa Tesoriera (Turin). Germaine Tailleferre: (b Parc-St-Maur, nr Paris, 19 April 1892; d Paris, 7 Nov 1983). French composer. Despite her father’s opposition and her equal skills in art she entered the Paris Conservatoire in 1904, her formative studies being undertaken with Eva Sautereau-Meyer. As a pianist prodigy with an amazing memory she won numerous prizes, and in 1913 she met Auric, Honegger and Milhaud in Georges Caussade’s counterpoint class. In 1917 Satie was so impressed with her two-piano piece Jeux de plein air that he christened her his ‘musical daughter’, and it was he who first brought her to prominence as one of his group of Nouveaux Jeunes. She then went on to become the only female member of Les Six when it was formed in 1919–20. Her career was also assisted by the Princesse Edmond de Polignac, who liked her ballet Le marchand d’oiseaux (1923) enough to commission a Piano Concerto (1923–4), which proved similarly successful and demonstrated her natural affinities with the 18th-century clavecinistes. Tailleferre’s talents fitted in perfectly with the prevailing spirit of Stravinskian neo-classicism, though she was also influenced by Fauré and Ravel, remaining in close contact with the latter throughout the 1920s. Unfortunately, Tailleferre never regained the acclaim she had enjoyed through her early associations with Les Six. Two unhappy marriages (to the caricaturist Ralph Barton in 1926 and to the lawyer Jean Lageat in 1931) proved a considerable drain on her creative energies, and her continual financial problems led her to compose mostly to commission, resulting in many uneven and quickly written works. Also, her natural modesty and unjustified sense of artistic insecurity prevented her from promoting herself properly, and she regarded herself primarily as an artisan who wrote optimistic, accessible music as ‘a release’ from the difficulties of her private life. However, her concertos of the 1930s enjoyed a measure of success, as did her impassioned Cantate du Narcisse (1938, words by Paul Valéry), and she was much in demand as a skilful composer of film music. After a fallow period in the USA (1942–6) she produced the superb Second Violin Sonata (1947–8) and turned her attention towards opera – her lighthearted approach being epitomized in the four short comic pastiches written with Denise Centore in 1955 (‘Du style galant au style méchant’). She also gave successful concert tours with the baritone Bernard Lefort, for whom she wrote the Concerto des vaines paroles (1954), and in 1957 she experimented briefly with serial techniques in her Clarinet Sonata. Although she continued to compose prolifically and teach until the end of her life, she resorted increasingly to self-borrowing and familiar formulae (like the perpetuum mobile), and the circularity of her career can be seen in the stylistic ease with which she was able to complete her 1916–17 Piano Trio in 1978. Meeting the conductor Désiré Dondeyne in 1969 led to a new interest in composing for wind band and she also remained devoted to children and their music, a link which helps explain the spontaneity, freshness and charm that characterize her best compositions.